A couple of years ago, I set out with an idea and a dream to write a fantasy short story series. And for the past year and a half, that dream’s only grown and grown. Now, I’m putting the final touches on my now novelette series, Last of the Memory Keepers, and I’m proud to reveal to you the cover and the title for the first story! Determined to make a difference anyway, she joins her father on her first diplomatic mission in the Southern Rim where negotiations are going smoothly. Almost too smoothly. Until a tragedy threatens to cease all negotiations within her lifetime and even start a war. Will Rhona ever be able to achieve unity when everything she believes about her world is shattered? Much thanks to my critique partner and fellow writer, Faith Boggus! 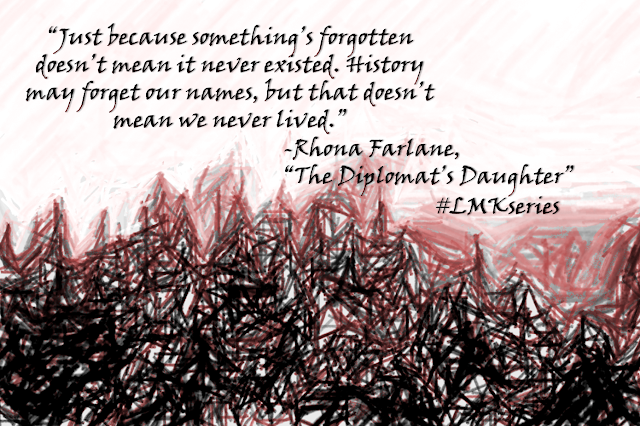 You did such a great job on bringing Rhona, my protagonist, to life through watercolor. I can’t wait to share her adventures with the rest of you, my dear readers. 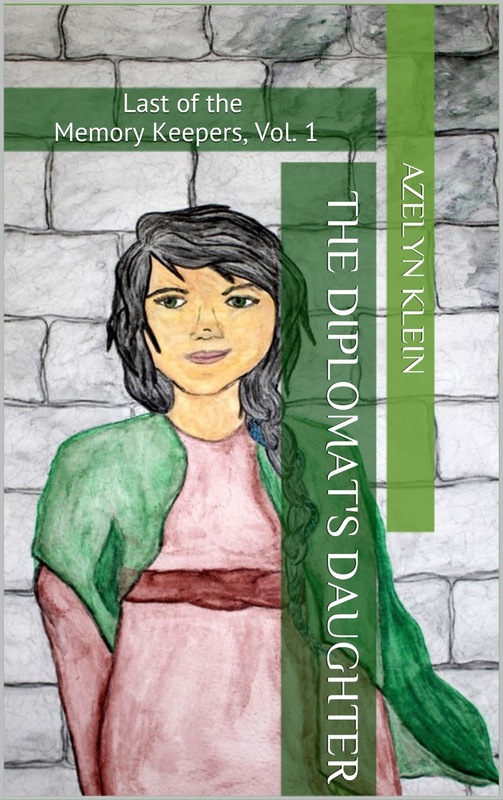 Mark your calendars for March 3rd because that’s when I plan on unleashing “The Diplomat’s Daughter” on the world! Father once told me that we’re all still a part of the human race, no matter what the Elders claimed. Which isn’t entirely true because thousands of years ago after our world began, we murdered the human race. Now we’re all that’s left. Spring of the year 4137, Finley proposed his most wonderful, foolhardy idea yet. Even at twenty years old, he was coming up with reckless ideas that would probably get us killed. Naturally, I supported his idea and Ellard protested. But not much. Not this time. Even as the pitch black of night in the stable shrouded his face, I could just hear the smile behind his tense voice. It wasn’t a question of whether we wanted to get caught but rather if Finley and I wanted to lose to him. Again. Despite being Apprentice Communicator, Ellard was a natural-born rider. With his parents both working in the stables, he was practically born in the saddle. I heard the creak of leather behind me as he swung himself into the saddle. Of course he could tack up and mount in the dark twice as fast as I could. Show off. I frowned and reached out in the dark, feeling for my mare’s head. Just as I managed to slip the bridle over her ears, I heard Finley mount up. “Come on, slowpoke!” he said. I adjusted the chin strap and ran my hand down the horse’s neck, searching for the saddle. In the two seconds it took me to mount, Finley and Ellard were already leading their horses around me in opposite directions. I squeezed the reins tight, wishing to stare down both of them, but I knew they were doing it just to get on my nerves. I kept silent from there on out as we rode past silhouettes of buildings, glad for the cover of clouds overhead. Just as long as my mare, March, could keep her footing—and we didn’t get caught—we’d be all right. After another minute, the last of the stone buildings gave way to rows of trees. The moon came out, lighting up the patches of the underbrush before us. “Why, respect of course,” Finley said. I adjusted the reins in my hand, and March swung her ears back, tense, awaiting the word. I couldn’t remember who shouted it, but I gave one kick and March surged ahead. With a pounding gallop, we tore off, bearing northward. The moonlight poured through the trees, just enough so that I could make out the underbrush and the boulders, just enough to tell that I was barely ahead of Finley on my left. Ellard was nowhere in sight, but I hadn’t the time to worry about him. We were riding hard, and I focused all my attention on the path. Just as we skirted around the northern rim of the Haven, Finley’s horse veered to the right, dodging a tree and nearly running into me. March stumbled, recovered, and blasted right through a bush, setting us behind Finley by several yards. I grit my teeth as he took the lead and squeezed with my knees, urging March for more speed. Finley held the lead all the way down the eastern side of the Haven and along the south. Just as we were curving back up west, I kicked again, letting out a shout, and managed to pull up next to Finley. We were riding neck-and-neck. Ellard’s horse charged between us, startling our horses. We pulled apart for a second, then galloped after him. But Ellard was already letting out a loud whoop as he charged through the trees where we started. He pulled his horse to a stop as Finley and I passed the trees simultaneously. I pulled back on the reins before we ran into Ellard. But even as we headed back towards the stables, I noticed how Ellard sat up a little straighter. If you haven't already, don't forget to pre-order your copy here! Let’s chat? Have you marked your calendar for March 3rd? Isn’t the cover pretty! What intrigues you most about the blurb/sample?